Earn at least £118 (for 2019-20) per week. For monthly paid employees the pay is multiplied by 12 and divided by 52 to arrive at an ‘average weekly pay’ figure. Have been continuously employed by that employer for a least 26 weeks up until the ‘Qualifying Week’. The ‘Qualifying Week’ is the 15th week before the baby is due, so in practice the employee must have been employed for at least 41 weeks before the expected date of birth of the child. The employee can choose to take either 1 or 2 complete weeks of leave. This leave cannot start before date of birth, must be taken all in one go, and and must end within 56 days following the birth of the child. Details of the Paternity leave is entered on the Calendar screen. Payroll Manager then applies the relevant rules and automatically calculates any OSPP due. Click ‘Employees‘ and then ‘Calendar‘ from the main menu in Payroll Manager. Ensure that you have the correct employee selected. Expected Date of birth/matching – Enter the expected date of birth of the child. 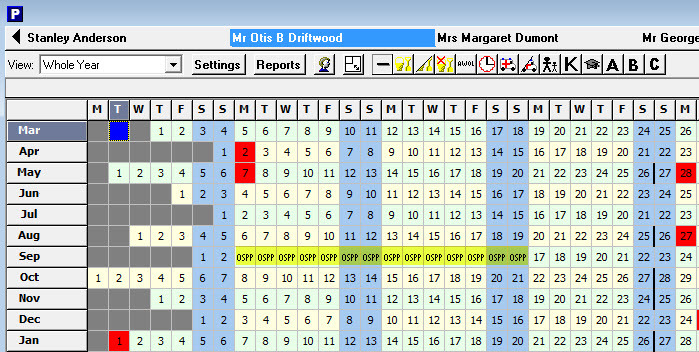 The expected date of birth will have been recorded by a doctor on the ‘MAT B1’ form issued to the mother. Actual Date of birth/placement – Enter the date that the baby was born. Please note that the rules on Paternity Pay stipulate that Paternity Pay cannot start before the date of birth of the child. Over-riding average weekly pay – Under normal circumstances this box should be left blank., In some circumstances (e.g. perhaps you have just taken over the processing of the payroll from someone else) Payroll Manager will not have enough pay history recorded for this employee and you should enter whatever was previously calculated as the ‘Average weekly pay’ for this employee in this box. Intended start of leave – Enter the date that the employee intends to start their leave. If this date is unknown then leave this field empty. Actual start of leave – Enter the date that the employee begins their leave. Please note that the rules on Paternity Pay stipulate that Paternity Pay cannot start before the date of birth of the child. Number of weeks leave intended – Enter either 1 or 2 in this box. Transfer of undertakings – under normal circumstances you would leave this box unticked. If the employee has recently (within the last 12 months) been transferred to this employer under ‘TUPE’ regulations then tick this box. Paternity for adoption – If the paternity leave is being taken due to adoption of a child then tick this box, otherwise leave it unticked. Add parenting pay to payslip – In normal circumstances you would ‘tick‘ this box, which has the effect of adding the OSPP as an item of the employees payslip. [ A message will appear regarding workplace pension contributions during parental leave asking if you wish to see more details. We would recommend that you read the guide provided before continuing. For the purpose of this particular guide it is assumed that you have already done so]. 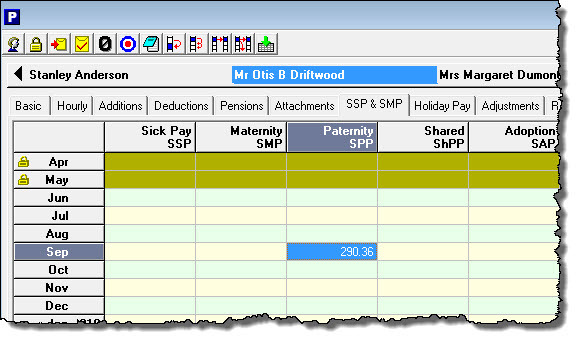 Details of the paternity leave and of any OSPP due will be shown on the ‘Calendar’ screen. In the example below, 2 weeks of OSPP has been calculated. A full report of the parenting leave with an explanation of how the OSPP has been calculated can be produced by clicking on the ‘Reports‘ button on the calendar and selecting the ‘Parenting‘ option. This report can be issued to the employee if required. The calculated OSPP will be displayed on the ‘SSP & SMP‘ tab of the ‘Pay Details‘ screen. OSPP can be reclaimed from HMRC by offsetting against any tax & NIC payment due in the same tax period. Payroll Manager will automatically reclaim the correct amounts and will schedule an ‘EPS’ (Employer Payment Summary) to inform HMRC of these amounts.